World renown artist, Antonio Pompa-Baldi first appeared on our stage in our 2002/03 season. Since that performance, he embarked on a career that continues to extend across five continents. 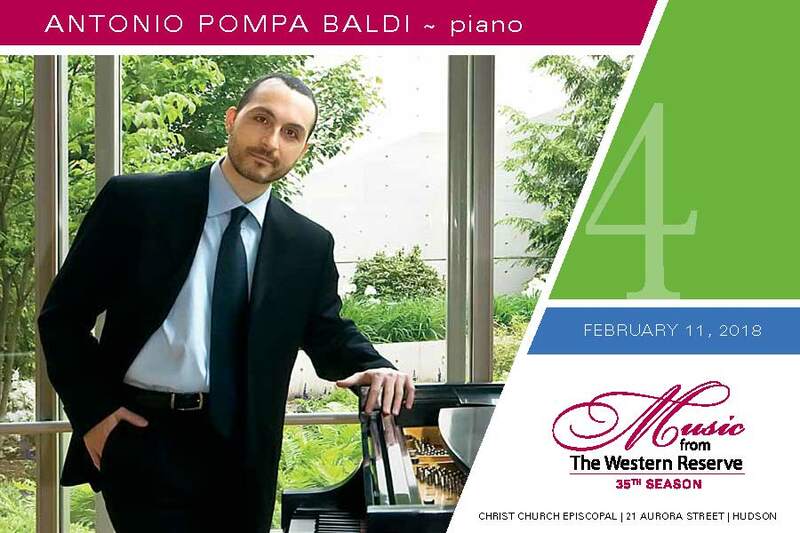 A native of Foggia, Italy, Mr. Pompa-Baldi won the Cleveland International Piano Competition in 1999 and prizes in several major international competitions. He continues to receive public and critical acclaim around the world. A Steinway artist, Mr. Pompa-Baldi is on the piano faculty of the Cleveland Institute of Music. In 1999, he won the Cleveland International Piano Competition which lead him to a career that continues to extend across five continents. He was also a top prize winner at the 1998 Marguerite Long-Jacques Thibaud Competition of Paris, Frances and a silver medalist at the 2001 Van Cliburn International Piano Competition. He continues to receive critical acclaim around the world. Pompa-Baldi performs regularly at the world’s major concert venues including New York’s Carnegie Hall, Paris’ Salle Pleyel, Milan’s Sala Verdi, Shanghai’s Grand Theatre, and Boston’s Symphony Hall. He has played with the Houston Symphony, Berliner Symphoniker, Orchestre Philharmonique de Radio France, Boston Pops, Colorado Symphony and many more. In addition to his extensive performing career, his recording collection features 20 CDs and is continuously growing. Some of his recordings include the entire piano repertoire of Grieg, his award-winning recital at the Van Cliburn Competition, a tribute to Liszt, an all-Rachmaninoff CD, the Rheinberger Piano Sonatas and more. He is the founder and faculty member of Todi International Music Masters, a summer Festival in Italy, and sits on the juries of the most prestigious piano competitions of the world, including the Cleveland International Piano Competition, the Hilton Head Piano Competition, the International Edvard Grieg Piano Competition in Bergen, Norway, and the San Jose International Piano Competition. Place your ticket order today!